Improve vehicle inspection times and mitigate risks. Find hidden problems that other inspections can’t by analyzing 100’s of OBD2 parameters in minutes! Live and online auctions are fantastic resources, but at times vehicles sold can be more trouble than worth. VehicleMRI can provide a comprehensive report of the vehicle’s condition from the inside out. Occasionally, vehicles may not be permitted to be driven but, VehicleMRI can help identify under-performing parts before reaching the lanes. VehicleMRI can also offer peace of mind and help minimize unexpected repair and transportation costs. Furthermore, vehicle inspectors will appreciate how quickly and thorough a VehicleMRI inspection takes before the vehicle even leaves the property. Whether you’re buying or selling, implementing VehicleMRI as an OBD2 component to your inspection will help streamline the process allowing you to focus on efficiency. Using predictive analytics and proprietary algorithms, VehicleMRI will help uncover hidden issues, adding additional value to condition reports while helping increase the overall purchase experience. 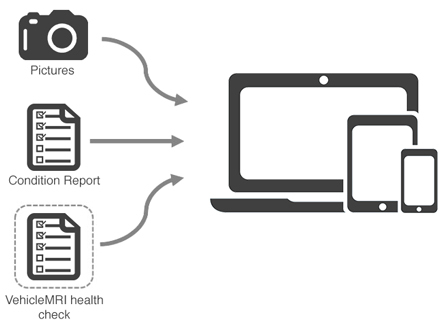 VehicleMRI can be added as an OBD2 component to existing condition reporting platforms.